On October 12, 1967 Capt John Kay Hardy, co-pilot and Col. Thomas G. Derrison II, pilot took off in their F4C Phantom Fighter/Bomber on an armed reconnaissance mission over North Vietnam. They were flying the lead aircraft in a flight of two over Quang Binh Province. They sighted ground targets and radioed to their wingman that they were “rolling in”. Shortly thereafter the wingman saw a flash of yellow light followed by a fire and a cloud of black smoke, then all attempts to contact the flight leader were unsuccessful. Capt. Hardy had begun flight training after graduation from the University of Southern California, he and the pilot had extensive experience in the Phantom. Their last known location was about 15 miles south of the city of Dong Hoi, some 25 miles north of the demilitarized zone. Anti-aircraft resistance was heavy in the region. Both of these flyers were declared as Missing In Action / Bodies Not Recovered. Jack and his family lived on Tachi, AFB, while he attended Narimasu. His sister Jill N. Hardy was a classmate of mine in the class of 1961. They lived at Tachi from 57 thru 59. 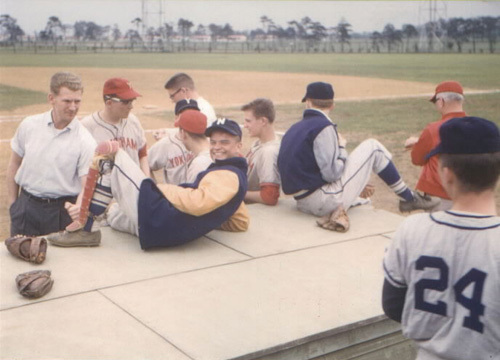 Jack was a member of the 1958 Baseball Champions for NARIMASU. The thing that I remember most about Jack was his school spirit, loyalty and ability to get along with all that ever came in contact with him. He was the type that hung in there giving his 110% come rain or shine and that drive would rub off to all those around him to get the job done regardless of what lay in their way. If Jack was able to eject from his aircraft and word came today that only one G.I. POW remained in North Vietnam, as we speak, my money would be on JACK. He was a survivor in all meanings of the word. As a Vietnam Vet, I do believe that there is too many cases left unsolved about our MIA’s and POW’s, and that our government has the ability to resolve these issues if they so desire. They sent us to that part of the world to serve our country’s interests and when those interests were gone our government shut the door on all that was left behind to include our brothers and sisters that were still there. The HARDY family deserves to know the truth at all costs and if Jack is still there he should be returned to his country and family. I was working at the NAS, North Island, San Diego, CA during the late sixties and early seventies. There was a program at the base where we were offered the bracelet and info to show our support of our troops. I had wondered all of those years what happened to “my POW” and had never found out until we had a replica of the “Wall” at Lufkin, TX last summer. I checked and found his name. I can’t imagine Jack as killed in Vietnam. I can’t even imagine Jack as a fighter pilot. I remember him as the coolest guy at Narimasu, when I was there from 56 to 58. Jack drove his parents’ yellow and white ’55 Chevy and played basketball like a wild man. He was the spark of the team . . . always full of energy, always surprising us with his moves. When I left and moved to Northern Virginia, I was amazed to learn he had followed me there . . . to Falls Church. It was in Virginia that we became really good friends, double dating for the prom, washing our cars together, and giving each other advice about women, most of it bad. I loved spending time with Jack. It made me feel cool. I thought we would always be friends . . . and then he disappeared from my radar screen. And now, forty years later, I learn that he disappeared from the world’s radar screen. It’s hard to imagine that someone so alive isn’t any longer. And I really miss him all of a sudden, even though I hadn’t heard from him in forty years. Not much, but hope this helps. I was so sorry when I saw his name on the Memoriam page. I remember Jack Hardy. He was a nice looking and very friendly person who always had a smile and something nice to say. I was very sorry to hear he had been killed. I first heard that he had been killed at our Tamecula reunion and was in disbelief, so I looked on the net for the V.N. Vets Memorial wall and there he was. I have no pictures. I just remember when he arrived at Narimasu how stateside L.A. cool he was. Yeah, we dated and had many good laughs. I will always remember two things mainly about Jack – that huge smile, and I will always see him crouched behind home plate. It just really hurts to loose these jewels. I remember both Jack and his twin Jill very well. We were all at Tachi AFB and were close friends. Jack and I dated a few times and my some of my best memories of him were his brilliant and sincere smile and compassionate ways. He was such a GOOD person, and I felt a great sadness when I saw his name listed as having been lost in Vietnam, even though I hadn’t seen him since 1957. We all lost something special when we lost Jack.